When YOU walk into a room, how does it change? ~ HELLO, my name is Blog! If you watch The Office, you know what I mean. Poor Michael. 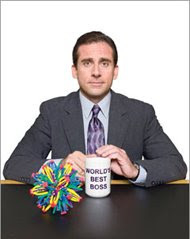 As the branch manager of Dunder Mifflin, every time he walks into the room, something bad happens. People walk the other way. Even in one particular episode, Stanley's stress monitor started beeping faster and faster as Michael approached him. Whatever change occurs to the room is a tangible representation of how your character, actions, words, reputation and personality have both preceded and affected the people around you. 1. Does your entrance shift the dialogue UP? If so, that could mean a few things: (1) people love to greet you, (2) people were just talking about you – probably positively – and now they’ve escalated the conversation because they’re excited to involve you, or (3) people were just talking about a particular topic they would LOVE to get your thoughts or opinion on. RESULT: Everyone is engaged, creating excitement in the air. SOLUTION: Learn the strategies for building a following. 2. Does your entrance shift the dialogue DOWN? If so, that could mean a few things: (1) people were just talking about you – probably negatively – but now they’ve stopped the conversation for fear of getting busted, (2) people were just talking about a particular topic they either don’t want – or are afraid to ask – your opinion on. RESULT: Everyone is walking on eggshells; creating anxiety in the air. EXAMPLE: Every boss I've ever had. SUGGESTION: Learn the strategies for creating a Question Friendly Environment. 3. Do people stare? If so, that could mean a few things: (1) something about your attractiveness – either physical or psychological – catches their eye, (2) something about your memorable presence and unique personal style immediately captivates their attention, (3) they were just talking about you - either positively or negatively – and now they can’t help but burn a hole in the back of your shirt. RESULT: You become The Observed, not The Observer. SUGGESTION: Learn the strategies for becoming the bulls-eye, not the arrow. 4. Are people curious or wondering about you? In this case, they’re not really staring, yet they are noticing you. If so, that could mean a few things: (1) you look like an interesting person, maybe because you’re smiling, laughing, or just appear fascinating and intriguing; (2) you’re wearing something unexpected that breaks their normal pattern of observation. RESULT: You increase the likelihood of an encounter. EXAMPLE: John Moore of Brand Autopsy. SUGGESTION: Learn how to become the most interesting person you know. RESULT: Word of Mouth has sparked. EXAMPLE: David “Rise to the Top” Garland. SUGGESTION: Learn the marketing strategies for moving people's eyebrows. 6. Do people come up to you? Some people move shyly in your direction. Others smile and walk towards you. Sometimes a mob of raving fans will run full speed with open arms, hoping to be the first to hug you! Either way, you’re approachable. People flock to you. They want to sit in your radius. RESULT: You’re the kind of person who always has one or two engaged people around you. SUGGESTION: Learn the strategies of Hangout Marketing. 7. Do they walk away from you? “Oh no, look who’s here. I better go into the other room…” “Gotta run. Don’t want to be seen by HER…” “Excuse me, but I just can’t stand that guy. I need to go outside for a few minutes…” Wow. Sounds like someone laid some poor quality track. RESULT: People who DON’T know you begin to question your credibility and character as they observe other people's reactions. EXAMPLE: That pushy insurance salesman who cornered you at last month’s Chamber of Commerce networking events. SUGGESTION: Learn the secrets for making communication a relaxing experience. NOTE: These are only a sampling of examples of how a room might change when you walk in. The outcomes will be different for everybody. The challenge (as a reminder) is that this moment has little to do with the room itself. REMEMBER: Whatever change occurs to a room as you walk in is a tangible representation of how your character, actions, words, reputation and personality have both preceded and affected the people around you. And if you’re not satisfied with the reactions you’ve been getting, don’t criticize the room. Instead, look in the mirror. For the list called, "19 Ways to be the One Person at Your Next Conference That Everybody Remembers," send an email to me, and I'll send you the list for free!